Wow, the past two weeks have been busy. It all started on May 9 with the Friends Plant Sale. Since then, I’ve been going non-stop. One big occupier of my time has been the community garden behind Sabathani Community Center on 38th Street in Minneapolis. I’m currently in my 4th year of coordinating the master gardener demonstration plot there. This year things got more complicated, because some other Master Gardeners and I decided to use the demonstration garden as a true teaching garden, and teach a class, en español, to a group of new gardeners. The class has had its share of hiccups, mostly weather-related, but we’re on our way. 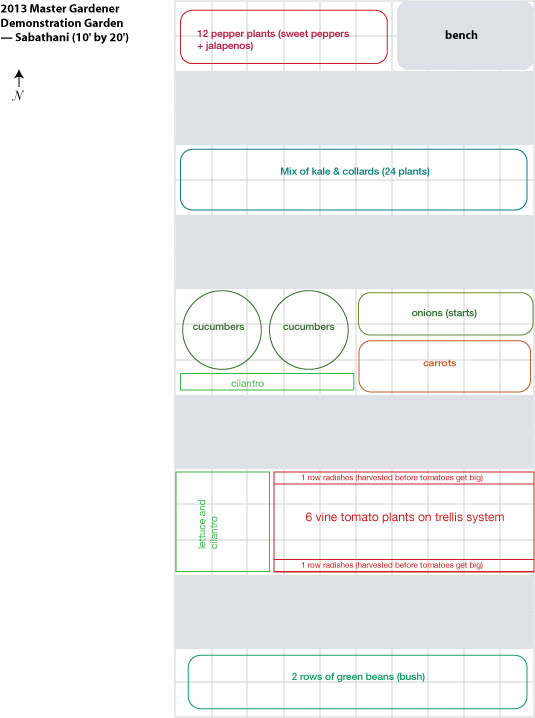 Here’s the layout of the Master Gardener demo plot for 2013. I always try to keep this simple, and dedicate lots of space to collards and kale. When I take our harvests to the food shelf every week, I get mobbed for my greens. I also tried to include examples of what I knew my students wanted to plant, so I could demonstrate. 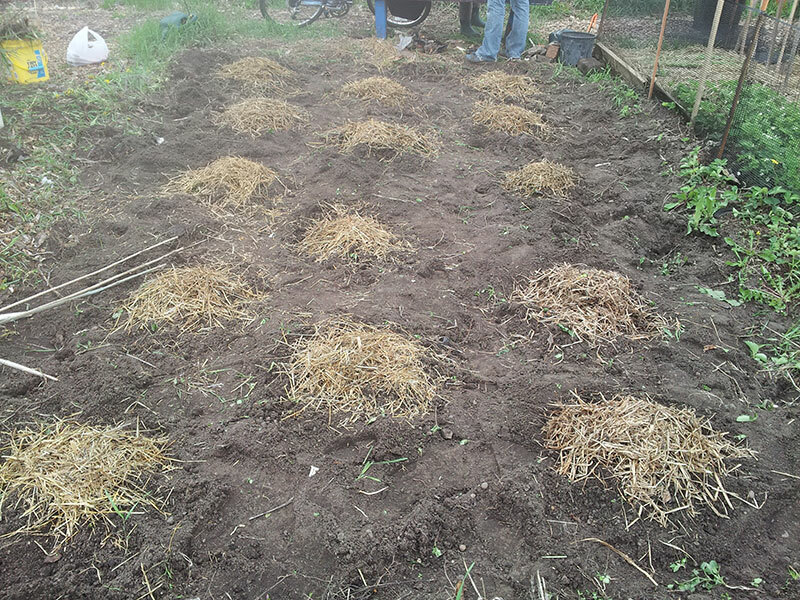 I haven’t gotten straw mulch down around the plants yet, because straw has suddenly become VERY hard to come by in Minneapolis, thanks to the straw bale gardening trend. But I got toilet paper collars (for cut worms) around the peppers and tomatoes today. That crooked trellis in the background will be for tomatoes, grown similarly to how I grow mine. 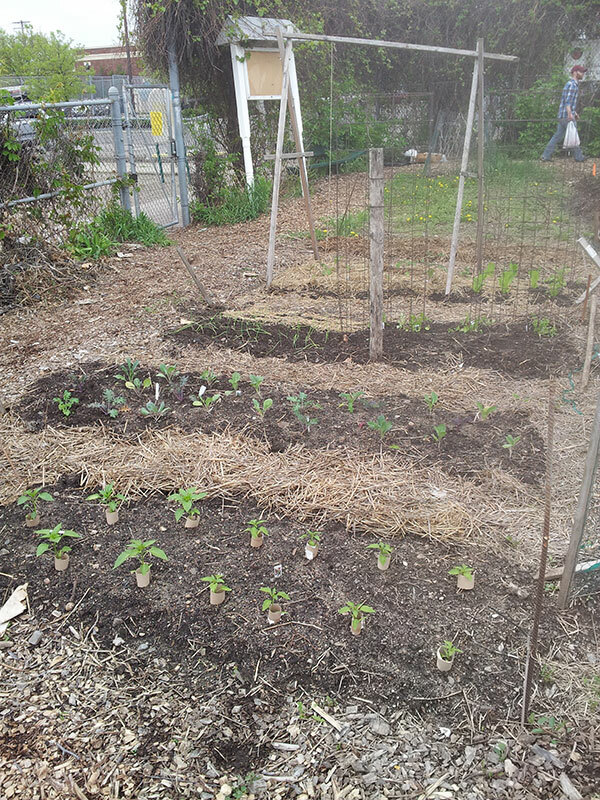 This week, I asked the main community garden coordinator about an empty plot that was near the demo plot, and whether anyone was using it this year. She gave her blessing, and I suddenly had to quickly come up with another 10’x20′ plan for myself! I wanted to keep things simple, and I’ve always wanted to try winter squash, so that’s what we planted today: 14 hills of it! Am I crazy?! Again, I had to conserve what little straw I had left, so I only put it on the actual hills for now. Tomorrow we’re going up north to visit our parents, and my dad, who knows actual farmers, has procured two bales of straw for me. So everything will get mulched in good time! I’m relatively new to growing squash. I’ve only tried it the one time before in my garden, and it ended early with squash vine borers. Hoping to avoid that here, I’ll add some nematodes in the next couple weeks. Got any advice about winter squash for me? 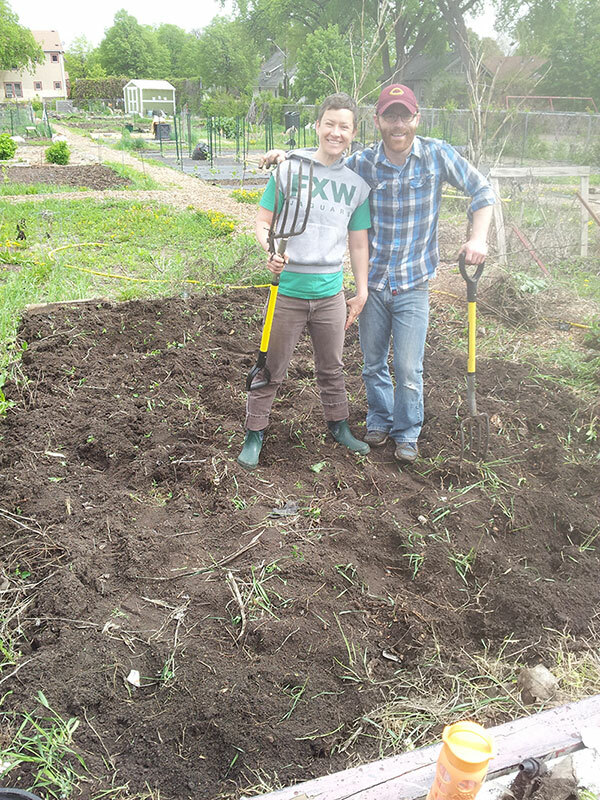 Categories: Community planning, Gardening, Practical, Theoretical | Tags: squash | Permalink. Cut your squash or pumpkin in half and scoop out the seeds. Don’t be too meticulous about the strings — they’re actually really good for you so go ahead and leave them in. Place the pieces cut-side down in a baking pan, and add about 1/2 in. of water to the bottom. Cover with foil and bake at 350 for about an hour or until soft. This very small pie pumpkin filled almost 2 trays. Freeze until set, then put cubes in a freezer-safe gallon-size plastic bag. 5 cubes = about 1 c. pumpkin. 2. Add 2-3 cubes to oatmeal as it’s cooking, then add cinnamon, cloves, dried ginger and a bit of sugar for pumpkin pie oatmeal. 3. Use it in pumpkin or squash soup recipes like this one. 4. Use it in any baking recipe (pumpkin bread, cookies) that calls for canned pumpkin. Note that it’s a little bit runnier than canned pumpkin; you will want to reduce the liquid in your recipe by a little bit. 5. Sneak a couple of cubes into boxed macaroni and cheese to add a little bit of nutrition. Categories: Cooking and baking, Practical | Tags: pumpkin, recipes, squash | Permalink.